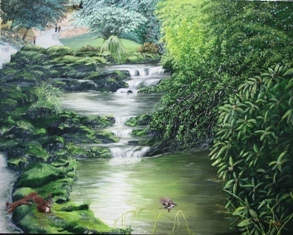 Showing the beautiful Peasholm Park in Scarborough, one of my most favourite places in the world. A gentle running stream flows into small ponds over trickling watefalls and rocks. The green foliage thrives in the shade of the towering trees above and all around. Birds fly from bush to bush enjoying the plants and water. little squirells play and hide, amusing the visitors to the park, who, in turn, feed them with nuts and treats bought from the park cafe. People stroll the walkways and paths leading them into one beatufull grove after another, always something different to see around each curve in the paths.